Are you having problems with your Daewoo Split Air Conditioner? 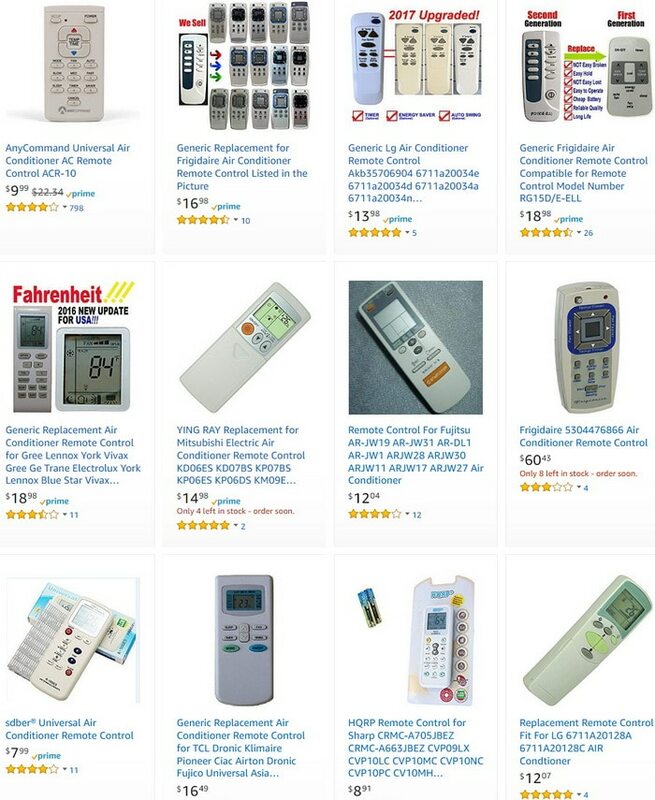 This page contains AC troubleshooting, remote controls, manuals and error codes. If you are having a problem with your Daewoo AC, you can find all the problems and solutions on this page. Remember if you have any unanswered questions about your Daewoo AC, please leave a question below with your model number AC and we will be happy to assist you. DAEWOO SPLIT AC PROBLEM = No power. POSSIBLE CAUSE = Power failure. SOLUTION = Restore the power. DAEWOO SPLIT AC PROBLEM = Line voltage too low. SOLUTION = Contact electrician to install new outlet. DAEWOO SPLIT AC PROBLEM = Unit is unplugged or not completely plugged in. SOLUTION = Insert plug all the way. DAEWOO SPLIT AC PROBLEM = Unit is off. SOLUTION = Turn unit on. DAEWOO SPLIT AC PROBLEM = Batteries in remote are weak or dead. SOLUTION = Replace remote’s batteries. 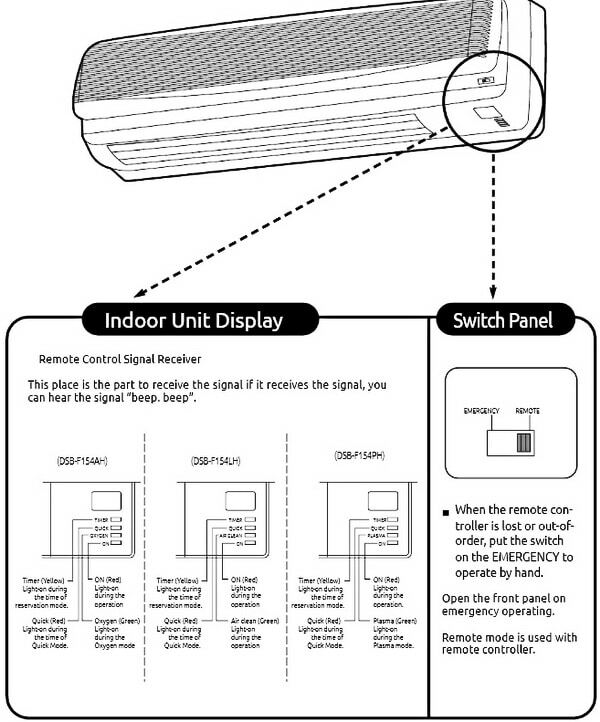 DAEWOO SPLIT AC PROBLEM = EMERGENCY/REMOTE switch is not set to REMOTE. SOLUTION = Slide EMERGENCY/REMOTE to REMOTE. POSSIBLE CAUSE = When the unit is first plugged in and turned on, the compressor will delay turn on for 3 minutes. SOLUTION = Wait 3 minutes for the unit to operate. 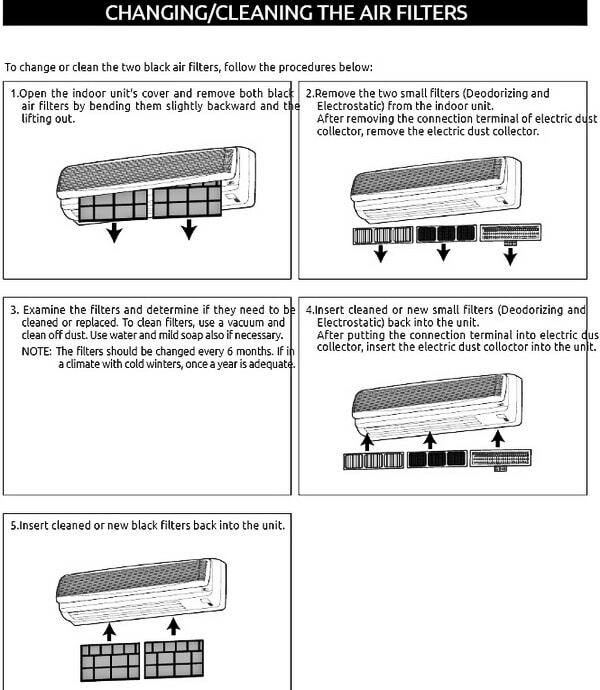 DAEWOO SPLIT AC PROBLEM = The air filter(s) is dirty or clogged. SOLUTION = Clean or replace filter(s). DAEWOO SPLIT AC PROBLEM = A door or window is open. SOLUTION = Shut door or window. DAEWOO SPLIT AC PROBLEM = There is an obstacle in front of intake or indoor unit. DAEWOO SPLIT AC PROBLEM = The temperature has been set improperly. SOLUTION = Check and reset if necessary. DAEWOO SPLIT AC PROBLEM = Strange sounds occur. 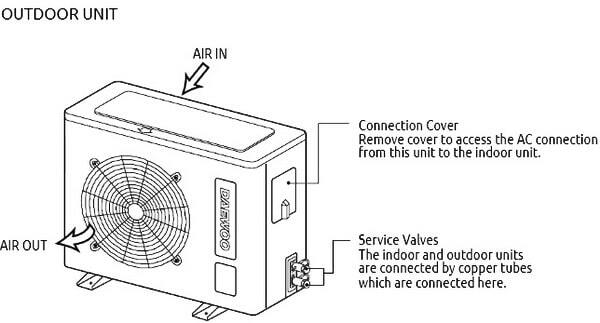 SOLUTION = During operation, especially after turning it on or off, refrigerant flows inside the unit. DAEWOO SPLIT AC PROBLEM = Strange smells occur. POSSIBLE CAUSE = The fan is bringing out the smells of the carpet, walls, etc. SOLUTION = The smell should go away shortly. DAEWOO SPLIT AC PROBLEM = No remote operation. 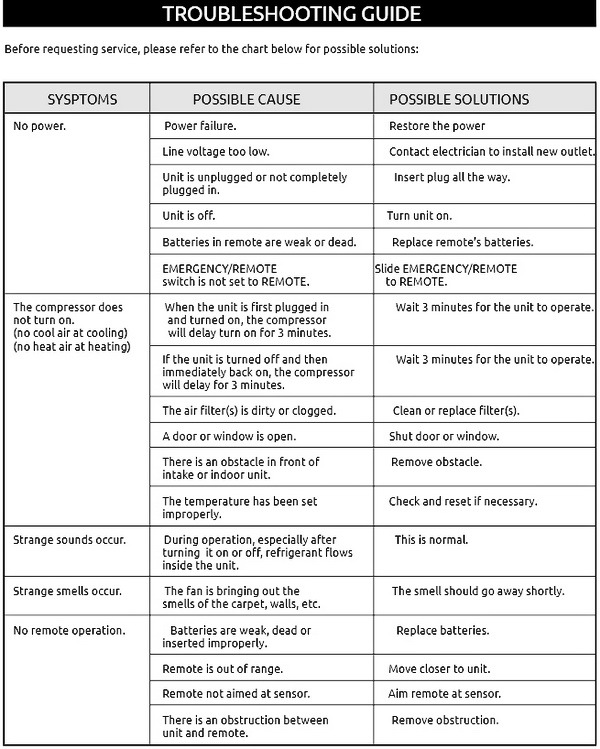 POSSIBLE CAUSE = Batteries are weak, dead or inserted improperly. 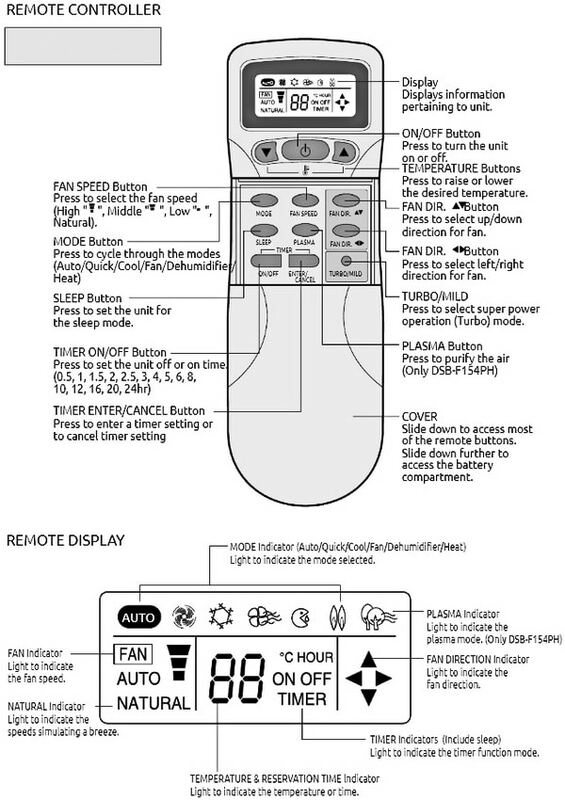 DAEWOO SPLIT AC PROBLEM = Remote is out of range. SOLUTION = Move closer to unit. 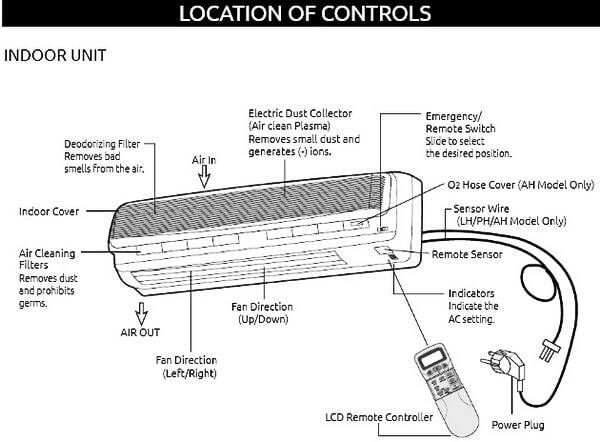 DAEWOO SPLIT AC PROBLEM = Remote not aimed at sensor. SOLUTION = Aim remote at sensor. There is an obstruction between unit and remote. If Neither indoor unit or outdoor unit runs. Check the following things first. -Is the timer mode set the “timer ON”. -Is the timer mode set the “timer-OFF” and the time had passed? If Neither outdoor fan or compressor runs while indoor fan runs. -Is the temperature set point suitable? -Has the 3 minutes time guard for compressor operated? The control will contain diagnostic test to verify the integrity of the system. DAEWOO SPLIT AC ERROR CODE 2 = Compressor – Electrical parts of compressor. DAEWOO SPLIT AC ERROR CODE 3 = Check the voltage between N and Y of terminal block. Check connecting wire of indoor unit and outdoor unit. Check fixing of indoor coil thermistor. Check the GAS LEAKAGE of the pipe. NEED A NEW DAEWOO AC REMOTE CONTROL REPLACEMENT? Have a look here as there are many to choose from. Remember if you have any unanswered questions about your Daewoo AC, please leave a question below with your model number AC and we will be happy to assist you. where can I get DSB-180LH(A/S) control PCB? I bought a 24,000 BTU Daewoo mini split system and hired a guy to put it up. The unit inside keeps displaying F1. So we read where the air thermistor could be bad. We have checked all over to find a new thermistor and I can’t find one. One company said the model # DSA-F2453LH-V is an invalid model number. Is there anyone who can help me? This is a freakin nightmare! Daewoo mini split air conditioner 12 btu model outside DSC-F1253LH-VH. On display presents FF? What is it? Air conditioner is working but showing E-3 message. Model DWC-F0520RLE. What does this mean?